The differential pressure gauge is based on two independently operating Bourdon tube measuring systems. The instrument is therefore able to show the pressure from two measuring points and the resulting differential pressure on one display. 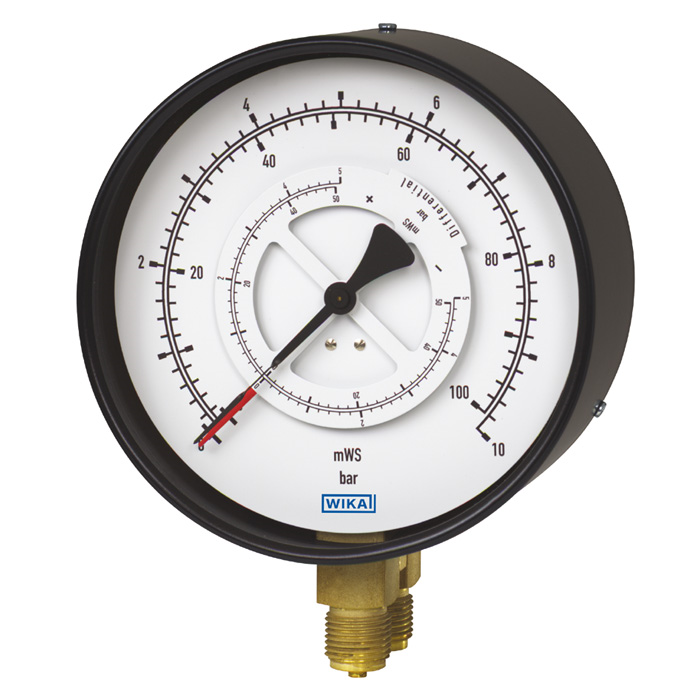 The standard version is designed with two pointers and a gauge pressure scale. The pointer for the minus connection is connected to an additional moving dial. On the scale of the moving dial, the differential pressure (± 50 % of the main scale's full scale value) can be read directly. Alternatively, in the version without additional moving dial, the differential pressure is not indicated. In the version with a subtracting movement, the differential pressure is indicated with only one pointer (the individual pressures of plus and minus connection are not displayed). The variance of scale versions ensures an optimal readability of all operating parameters. The models 731.12 and 733.02, with wetted parts from stainless steel, have been specifically designed for the requirements in the process industry. For harsh operating conditions (e.g. vibration), the instruments are also available with an optional liquid filling.